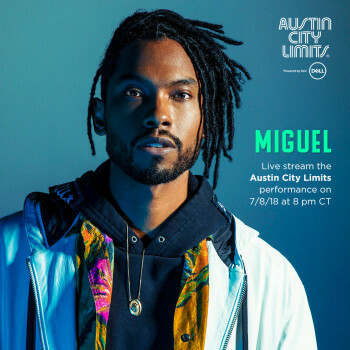 Austin City Limits is excited to announce that we will be live streaming the upcoming debut taping from R&B singer/songwriter Miguel on July 8 here on the ACL TV YouTube channel. Over the last decade, Miguel has established himself as one of R&B’s most sonic fabulists, a consummate artist unafraid to follow his impulses wherever they lead him. The Los Angeles native’s mix of funk, rock, hip-hop and electronica has garnered him frequent comparisons to Prince and Babyface. Miguel’s fourth studio full-length, War & Leisure, is his most ambitious and stunning project yet, a perfect blend of forward-thinking production and melodic delights that more than embody the duality hinted at in the album’s title. Miguel conceived these twelve pop gems as perfectly blending the skyward pop of 2012’s Kaleidoscope Dream (which netted him a Best R&B Song Grammy win in 2013 for its astounding single “Adorn”) and the restless, moody vibes of 2015’s Wildheart—reflecting the true Miguel experience for both listeners and the album’s creator. “On every project, I’m trying to paint a picture for my future self to go back, listen, and remember my experiences and how I was perceiving the world through music,” he states on the mercurial meeting point that War & Leisure reaches. “Kaleidoscope Dream and Wildheart are two sides of the same coin, and this is me taking those sounds and applying all the energy I’m feeling most from those two contrasts.” This is Miguel fusing the two halves of his creative id—the restless experimentalist and the crowd-pleasing hitmaker that millions of fans adore—to reach a new peak in artistic achievement. 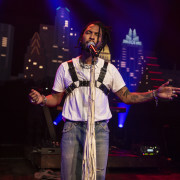 Join us on July 8 for this full set live stream of Miguel’s debut taping here on our ACLTV YouTube channel. The broadcast version will air on PBS this fall as part of our upcoming Season 44.